Is This The Beginning Of The End For The SAT And ACT? : NPR Ed George Washington University is the latest and one of the largest private universities to drop its admissions testing requirement. Carol McMullen-Pettit (right), a Premier Tutor at The Princeton Review, goes over SAT test preparation with 11th-grader Suzane Nazir in Pembroke Pines, Fla. Many high schoolers hoping to attend George Washington University in Washington, D.C., one of the top private universities in the country, breathed a sigh of relief this week. GWU announced it will no longer require applicants to take the SAT or ACT. The move comes after the school formed a task force to study the pros and cons of going "test-optional." GWU attracts lots of high-achieving students who do well on both exams, but the task force concluded that the school's reliance on these tests was excluding some high-achieving students who simply don't test well. Of particular concern were low-income, minority students who don't even bother to apply because their scores are too low. GWU will still require pre-med and home-schooled students, as well as athletes, to submit test scores, but, like many of the more than 800 other four-year colleges and universities that were already test-optional, it hopes its admissions criteria will now capture a more diverse pool of students. David Hawkins, head of research at the National Association for College Admission Counseling, or NACAC, says the move to test-optional is significant because of GWU's national reputation as a top, selective institution. NACAC's own research has found that some schools are considered "selective" because of their lofty SAT or ACT average scores. But it's not at all clear whether performance on those tests is a reliable predictor of future academic success. In response to the news, the nonprofit College Board defended the importance of its SAT: "Overwhelming evidence shows that SAT scores and high school GPA in combination are the best predictors of college success. Evidence also shows that test-optional policies do not increase socio-economic and racial diversity on college campuses — which is what these policies claim to achieve." The ACT, now more widely used than the SAT, has also argued that an A student at one high school is not necessarily comparable to an A student at another, more academically demanding school. In other words, tests like the SAT and ACT can help institutions guard against grade inflation. Paul Weeks, a senior vice president with ACT, says GWU's decision sounds like a marketing ploy. "I can't understand why a school would consider admitting a student without a test score but not admit a student with a (low) test score," Weeks says. Last year, NPR was given exclusive access to a study that found that a student's high school academic record, regardless of what school she attended, is a far better predictor of college success than the SAT or ACT. This first-ever study was conducted by William Hiss, the former dean of admissions at Bates College in Maine. Bates has been test-optional since 1984. Hiss studied 33 test-optional schools — big and small, private and public — then compared "non-submitters" to students who had submitted SAT scores. He found virtually no difference in college grades or graduation rates. Students who did not submit their scores did just as well as those who did. "By any statistical methodology the differences [between submitters and non-submitters] are completely trivial," Hiss told NPR's Eric Westervelt. The study supported what test-optional institutions have maintained for years. The most reliable predictors of college success are a high school student's GPA and the rigor of the courses taken. Critics of the SAT and ACT have long argued that these tests are nothing more than sorting tools that help institutions deal with large numbers of applicants. That's why George Washington University's decision to make the SAT and ACT optional is important. With 25,000 students, it is now one of the largest, most influential institutions in the country to declare itself "test-optional." Until now, most test-optional schools have been small and therefore more adept at spending the time, money and energy to closely examine every applicant's high school record, background and accomplishments in and out of school — what GWU officials call more "holistic" criteria. 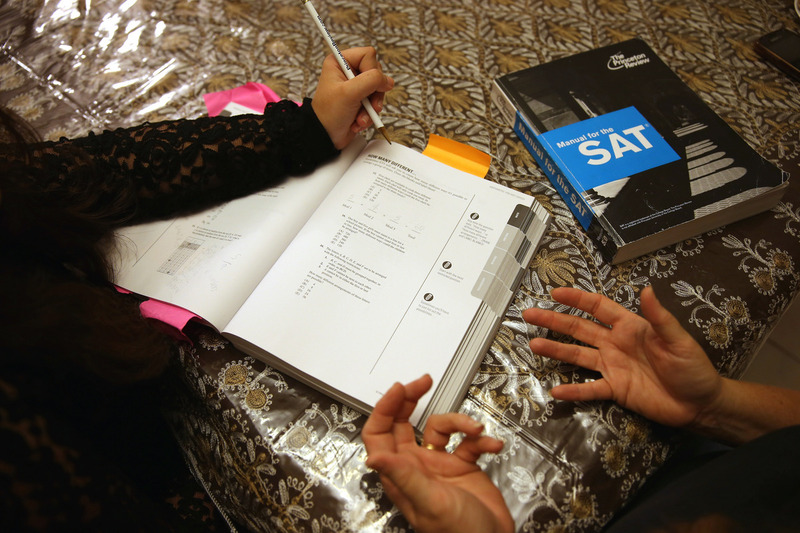 Is this the beginning of the end for the SAT and ACT? Probably not. Filtering tens of thousands of applicants without the help of these powerhouse tests is a daunting and expensive task for larger schools. And most of the nation's best, most-selective institutions still rely on them. But, with GWU adding its high-profile name to the list of testing naysayers, other big schools will no doubt give the idea a second thought.